In my previous post It’s the GPM� I discussed the importance of matching flow rate to tactical application. This post was in part a response to LT Bob Shovald’s article Improving Preconnect Function and Operation which was published in the October issue of Fire Engineering magazine. More recently, I read an article by FF Armand Guzzi on Firehouse.com titled Analysis of Effective Fire Streams-Part I. Both LT Shovald and FF Guzzi advocate the use of low-pressure, high flow nozzles on 1-3/4″ (45 mm) hoselines based in large part on the reduction in nozzle reaction when compared with a nozzle operating at the same flow rate with 100 psi (700 kpa) nozzle pressure. I have no argument with LT Shovald’s and FF Guzzi’s observation that lower nozzle pressure makes handlines easier to handle. 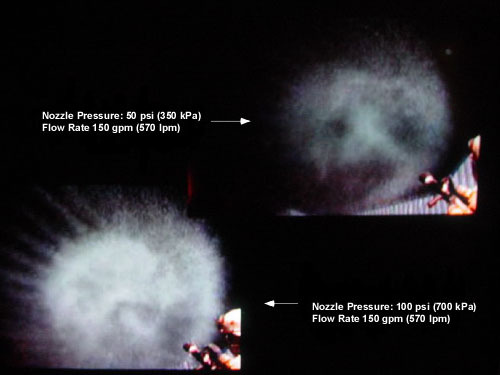 As illustrated below the nozzle reaction from combination nozzles set for a straight stream pattern have considerably less nozzle reaction at 75 psi (525 kpa) or 50 psi (350 kpa) than at 100 psi (700 kpa). As the preceding table illustrates, lowering nozzle pressure from 100 psi (700 kpa) to 75 psi (525 kpa) reduces the force of nozzle reaction by roughly 16%. If nozzle pressure is reduced further to 50 psi (350 kpa), nozzle reaction is reduced by approximately 24%. However there are other consequences of lower nozzle pressure. Lower nozzle pressure increases potential for kinking. This can to some extent be addressed through good hose handling, but if kinks are not removed, flow rate is reduced. Lower nozzle pressure also results in larger droplet diameter. What difference does that make? As discussed in It’s the GPM, conversion of water into steam is what does the majority of the work in fire control. 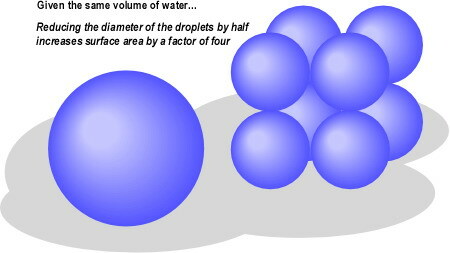 A given volume of water in large droplets has less surface area than the same volume of water in smaller droplets as illustrated below. When applying water in a direct attack, water is used to cool surfaces and the principal concern is that the stream has sufficient reach and penetration to get to the intended surface. In this application, droplet size has limited effect, since the objective is to put water directly on the burning fuel or hot surface and develop a thin film. A thin film of water will quickly convert to steam, taking energy away from the fuel surface, reducing pyrolysis and achieving extinguishment or cooling the unignited surface. However, when water is used to cool the hot gas layer, droplet diameter is extremely important. Droplets must be large enough to have sufficient reach, but be small enough to vaporize while passing through the hot gas layer. Large droplets will either pass through the hot gas layer vaporizing on contact with compartment linings (resulting in excessive steam production) or falling out of the hot gas layer before vaporizing. The following photos illustrate application of a short pulse at a flow rate of 150 gpm (568 lpm) at both 50 psi (350 kpa) and 100 psi (700 kpa). How exactly do effectiveness and efficiency apply to hoseline operation and fire streams? An action is effective when it is adequate to accomplish a purpose; producing the intended or expected result. It is efficient when performing or functioning in the best possible manner with the least waste of time and effort. An effective fire stream quickly accomplishes the task at hand, whether this is controlling the fire through direct or indirect attack, cooling hot gases overhead, or cooling exposed, but unignited surfaces. An efficient fire stream absorbs the greatest amount of energy with the lowest volume of water. As applied to hoseline deployment, effectiveness and efficiency of application are dependent on the hoseline being quickly stretched to the appropriate location for water application. Hoseline deployment and water application must be effective and efficient. 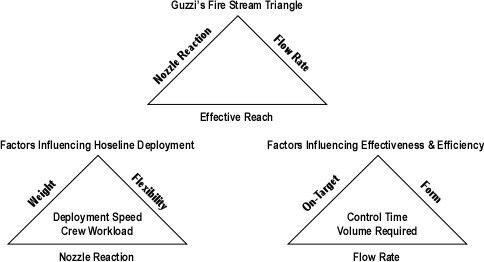 However, Guzzi’s fire stream triangle, confounds these concepts and misses several key influencing factors. The following graphic disentangles these concepts and expands on Guzzi’s simple graphic representation. While water application must exceed the critical rate of flow, continuing to increase flow rate brings diminishing returns (in fire control speed) while increasing the total volume of water use discussed in It’s the GPM. Maximizing both effectiveness and efficiency requires a handline with high flow capability with a nozzle that can be used to adjust the flow rate based on conditions and the task at hand. Both automatic and variable flow nozzles provide this capability. Discussion of fire stream effectiveness and efficiency will continue in my next post with an examination of nozzle selection considerations. I frequently observe that surprises on the fireground are bad. Unexpectedly worsening conditions can place firefighters at risk and often result in injuries and fatalities. However, event unexpected success can be problematic, as we don’t know why we were successful (and will likely attribute it to our mastery of the firefighting craft). When we are surprised by fire development or the effectiveness or ineffectiveness of our tactical operations, we really don’t know what is going on! Recognizing critical fire behavior indicators and being able to predict likely fire behavior is a critical skill for firefighters and fire officers at all levels. Every fire sends out signals that can assist the firefighter in determining the stage of fire development, and most importantly the changes that are likely to occur. This skill is essential to ensure the correct firefighting strategy and tactics are employed. Being able to “read a fire” is the mark of a firefighter who is able to make decisions based on knowledge and skill, not guess work or luck. Shan developed a scheme for organizing critical fire behavior indicators that focused on Smoke, Air Track, Heat, and Flame (SAHF). As we worked together in refining this system, I found that one element was missing, the building. Adding building factors that influence fire behavior provides a reasonably comprehensive approach to reading the fire to identify the stage of fire development, burning regime, and likely fire behavior. The simple mnemonic B-SAHF (Building-Smoke, Air Track, Heat, & Flame) can be used to remember this simple approach to reading the fire. Note: This concept map only illustrates the second level of detail in examining the B-SAHF indicators. It is important to extend this map by adding additional detail in each of the categories. For example, in building factors, size may be expanded to include building area and height, number of stories, internal compartmentalization, etc. For a more detailed look at B-SAHF, down load a copy of the full version of B-SAHF Version 5.2.1 in PDF format. Building: Many aspects of the building (and its contents) are of interest to firefighters. Building construction influences both fire development and potential for collapse. The occupancy and related contents are likely to have a major impact fire dynamics as well. One of the key factors related to building factors is that they are present before the fire starts. Fire behavior prediction (at least in general terms) should be a key element in pre-incident planning. Look at the building and visualize how a fire would develop and spread based on key building factors. Smoke: What does the smoke look like and where is it coming from? This indicator can be extremely useful in determining the location and extent of the fire. Smoke indicators may be visible on the exterior as well as inside the building. Don’t forget that size-up and dynamic risk assessment continue after you have made entry! Heat: This includes a number of indirect indicators. Heat cannot be observed directly, but you can feel changes in temperature and may observe the effects of heat on the building and its contents. Remember that you are insulated from the fire environment, pay attention to temperature changes, but recognize the time lag between increased temperature and when you notice the difference. Visual clues such as crazing of glass and visible pyrolysis from fuel that has not yet ignited are also useful heat related indicators. Flame: While one of the most obvious indicators, flame is listed last to reinforce that the other fire behavior indicators can often tell you more about conditions than being drawn to the flames like a moth. However, that said, location and appearance of visible flames can provide useful information which needs to be integrated with the other fire behavior indicators to get a good picture of conditions. It is important not to focus in on a single indicator, but to look at all of the indicators together. Some will be more important than others under given circumstances. Learning to read the fire takes practice and a solid understanding of practical fire dynamics. This post introduces the concept of B-SAHF and the B-SAHF exercise as a method for improving your skill in reading the fire. After completing the B-SAHF exercise, view the remainder of the video. Did you successfully predict the fire behavior that occurred? What conditions do you think the firefighters encountered on the interior of the structure? Developing skill in reading the fire requires practice. Additional B-SAHF exercises will be posted on a regular basis at cfbt-us.com. If you have a video clip or photo that you would be willing to share for a B-SAHF exercise, please visit the Contact Us page and send me an e-mail. Also check the CFBT-US Resources page for additional information on Reading the Fire! Previous posts examined an incident in which a number of Loudoun firefighters were injured in a flashover. See Loudoun County Virginia Flashover, Loudoun County Flashover: What Happened, and Loudoun County Flashover: Escape from Floor 2. Several weeks ago Loudoun County Fire, Rescue, & Emergency Management released a presentation including video shot by a civilian bystander during the incident. 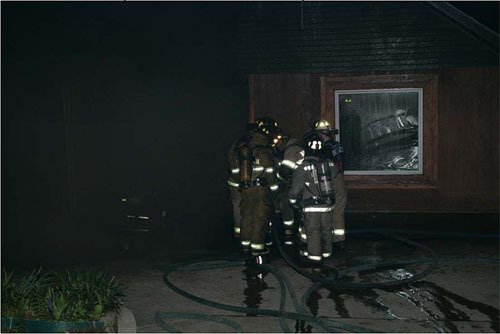 Print a second copy of the B-SAHF Worksheet and view the Meadowood Court Video, using the worksheet to examine the fire behavior indicators visible from the exterior. Loudoun County Fire, Rescue, & Emergency Management has also made this video available for download: Meadowood Courth Video Download. The National Institute for Occupational Safety and Health (NIOSH) conducted a public stakeholder meeting in Chicago, IL on 19 November 2008 to hear input and recommendations on the Firefighter Fatality Investigation and Prevention Program. Dr. Christine Branche, Acting Director of NIOSH opened the meeting by emphasizing that this program must be relevant, have high scientific quality, and impact on firefighter health and safety. Dr. Branche requested the participants to review and provide input on Draft strategic Plan for the NIOSH Firefighter Fatality Investigation and Prevention Program. Tim Firefighter Fatality Investigation Program Project Officer Tim Merinar and Dr. Tom Hales who manages the Cardiovascular Disease and Medical elements of the program provided a program overview and outlined future directions that were identified on the basis of the 2006 stakeholder meeting and other program review efforts. One key area was an increased emphasis on fire dynamics. NIOSH has taken some steps in this direction through staff training and recruitment of investigators with a fire service background. However, much more remains to be done! Paul Moore, Chief of the Fatality Investigations Team provided an overview of the Firefighter Fatality Investigation and Prevention Program Strategic Plan. This plan includes strategic goals (top level goals that state a specific desired change), intermediate goals (activities that NIOSH believes should be taken by stakeholders), activity/output goals (statements of NIOSH program activities), and performance measures (metrics indicating progress). I was encouraged by a number of the goals identified in the strategic plan related to reducing deaths and injuries associated with structural firefighting. Strategic Goal 2: Reduce deaths and injuries associated with structural firefighting operations by 2015. Intermediate Goal 2.1: Fire Service agencies and labor organizations will develop safety interventions based on fatality investigation findings. These goals are a good starting point. However, if investigation findings do not clearly identify causal and contributing factors, accomplishment will be difficult. One of the intermediate goals in this section was a bit more problematic. Intermediate Goal 2.3: Standards setting agencies will modify standards that apply to the design, maintenance, operation, and training regarding fire fighter personal protective technology based on investigation findings. What could be wrong with this? It sounds perfectly reasonable. It is, but it does not go far enough. Standards setting agencies such as the National Fire Protection Association (NFPA) develop standards for many aspects of our work, including those related to professional qualifications which frequently determine the content of fire service training programs. I believe that this goal should be expanded beyond personal protective technology to include professional qualifications and operational practices. Activity/Output Goal C: Seek peer and stakeholder input to improve the quality of products and impact of the program. Performance Measure C.1: 75% of fatality investigation reports will be reviewed by external experts prior to finalization and 100% of other publications will be reviewed by peer and/or stakeholder reviewers prior to finalization. Performance Measure C.2: Expert consultation and/or equipment testing will be sought on all investigations suggestive of personal protective technology malfunctions or failures. Performance Measure C.3: Stakeholder input will be sought at least every two years through a public meeting and/or docket. I would encourage NIOSH to examine the process by which they select peer or stakeholder reviewers for specific types of incidents to ensure the greatest technical expertise is brought to bear. In addition, it would be useful to expand Performance Measure C.2 to include more than equipment. In depth fire behavior analysis and in some cases fire modeling would provide extremely useful information to development of effective intervention strategies. Ongoing feedback from the stakeholder community is critical. However, the turnout at this meeting was disappointing with few stakeholder presentations outside those made by national fire service organizations such as the International Association of Firefighters (IAFF), International Association of Fire Chiefs (IAFC), IAFC Health, Safety, & Survival Section, and NFPA. The strategic plan also spoke to the need to increase the fire service expertise of the NIOSH staff involved in firefighter fatality investigations. Activity/Output Goal D: Increase the fire service expertise of FFFIPP personnel. Performance Measure D.1: Each fatality investigator will take at least one fire service training course or attend a fire service conference specifically for training purposes annually. Performance Measure D.2: Any announcements seeking to fill investigator positions will require previous fire service expertise in addition to occupational safety and health training and experience. These are positive steps, but it would be useful to provide a bit more direction with regards to what type of fire service expertise should be developed. For example, if the investigators will be examining incidents involving structural firefighting operations, developing competence in fire dynamics and the impact of tactical operations would be a high priority. In considering the experience of potential investigators, it is essential to examine both the breadth and depth of that experience, particularly in relation to understanding of fire dynamics and influence of tactical operations on fire behavior. Feedback on the Firefighter Fatality Investigation and Prevention Program Strategic Plan can be submitted until 19 December 2008 via e-mail to niocindocket@cdc.gov (attachments should be formatted in Microsoft Word). I would encourage all of you to take the time to review this document and provide your input on this essential program. My feedback on the limitations of NIOSH death in the line of duty reports dealing with incidents where fire behavior and/or limited understanding of fire dynamics were causal or contributing factors in line-of-duty deaths was well received. In addition, my observations were supported by several of the other stakeholders, most strongly by Rich Duffy, Assistant to the General President of the IAFF. While constrained by limited resources, the NIOSH staff is committed to serving the needs of the nation’s fire service and truly desires to provide quality information that is relevant, and most importantly has a positive impact on firefighter safety and health. I will continue my efforts to ensure that this becomes a reality in fire behavior related incidents. This post is a continuation of my feedback to the National Institute for Occupational Safety and Health that will be presented at the public stakeholder meeting conducted in Chicago, IL on 19 November 2008. My recommendations are presented in the form of an analysis of NIOSH Report F2007-29. This incident resulted in the death of Captain Kevin Williams and Firefighter Austin Cheek of the Noonday Volunteer Fire Department. This post continues with discussion the NIOSH reports examination of the influence of ventilation in this incident and provides specific recommendations for improvement of the NIOSH Firefighter Fatality Investigation and Prevention Program. The NIOSH report makes a general recommendation that “fire departments should ensure that properventilation is done to improve interior conditions and is coordinated with interior attack”� [emphasis added]. However, the report is misleading and fails to address key issues related to tactical ventilation, its effective application, and its tremendous influence fire behavior. NIOSH Report F2007-29 indicated that positive pressure ventilation was initiated prior to the second entry by the initial attack crew (a significant difference from the information provided in the Texas State Fire Marshal’s report). However, no mention is made of any action (or lack thereof) to create an adequate exhaust opening for effective horizontal positive pressure ventilation. While advising that ventilation needs to be proper, it would be helpful to provide more specific guidance. Lack of an adequate exhaust opening prior to pressurizing the building has been a major factor in a number of incidents in which application of positive pressure resulted in extreme fire behavior such as ventilation induced flashover or backdraft. Positive Pressure Attack for Ventilation and Firefighting (Garcia, Kauffmann, & Schelble, 2006), Fire Ventilation (Svensson, 2000), and Essentials of Firefighting (IFSTA, 2008) all emphasize the importance of creating an adequate exhaust opening prior to application of positive pressure. The NIOSH report pointed out that smoke pushed out the inlet and overrode the effects of the blower, but attributed this to the presence of an attic floor that interfered with vertical ventilation rather than the lack of an adequate exhaust opening for the initial horizontal ventilation. The PPV fan and vertical ventilation had little effect due to an attic floor being installed. At 0231 Chief #2 had horizontally vented the window on the D side near the A/D corner. In this incident, ventilation was being performed while the interior attack crew was already inside working. When the ventilation was completed, minimal smoke was pushed out of the vented hole but dark smoke pushed out of the front door, in spite of the fact that a PPV fan was set up at the front door. Note: The dark smoke pushing out the door indicated that the conditions were worsening and the vertical ventilation was not impacting the fire. In addition, the report fails to note that the opening made on Side D near the AD Corner placed the attack team between the fire and an exhaust opening. As with lack of an adequate exhaust opening, this has been demonstrated to have the potential for disastrous consequences (see NIOSH Death in the Line of Duty F2004-02). Command ordered companies to abandon the building at 0234 hours using three air horn blasts as an audible signal. The NIOSH report indicated that heavy fire “continued to roll out the front door”� but it is unclear how soon this occurred after smoke conditions at the doorway changed. NIOSH Report F2007-29 does not clearly identify that extreme fire behavior was a causal or even contributory factor in the deaths of Captain Williams and Firefighter Cheek. It simply states that they died as a result of smoke inhalation and thermal burns. NIOSH made six recommendations based on analysis of the incident in which Captain Williams and Firefighter Cheek lost their lives. Several of these recommendations focused on factors that may have contributed to these two LODD. These included radio communications equipment and procedures, accountability, rapid intervention, and the importance of mutual aid training. Two recommendations were more directly related to causal factors: The importance of ongoing risk assessment and use of proper and coordinated ventilation. However, these broad recommendations miss the mark in providing useful guidance in minimizing the risk of similar occurrences. Ensure that the IC conducts a risk-versus-gain analysis prior to committing to interior operations and continue the assessment throughout the operation. This statement is necessary but not sufficient. Size-up and risk assessment is not only the responsibility of the incident commander. All personnel on the fireground must engage in this process within the scope of their role and assignment. Understanding practical fire dynamics is critical to firefighters’ and fire officers’ ability to recognize what is happening and predict likely fire behavior and the influence of tactical operations. To effectively address this issue, NIOSH death in the line of duty reports must be explicit and detailed with regards to key fire behavior indicators observed, subsequent fire behavior phenomena, and the influence of the action or inaction of responders on fire development. Fire departments should ensure that proper ventilation is coordinated with interior attack. NIOSH Report 2007-29 focused on the ineffectiveness of the vertical ventilation, but failed to recognize the impact of the sequence of action (i.e. pressurization of the building and creation of exhaust openings), inadequacy of initial exhaust openings, and eventual location of exhaust openings in relation to the operating position of Captain Williams and Firefighter Cheek. As with situational awareness, effective tactical operations are grounded in training, education, and experience. The incident commander and crews tasked with carrying out tactical ventilation must understand how these tactics influence the fire environment and fire behavior. As with size-up and risk assessment, this is dependent on an understanding of practical fire dynamics. Other than indicating that ventilation must be coordinated with interior attack, the NIOSH report did not speak to fire control operations conducted during this incident. 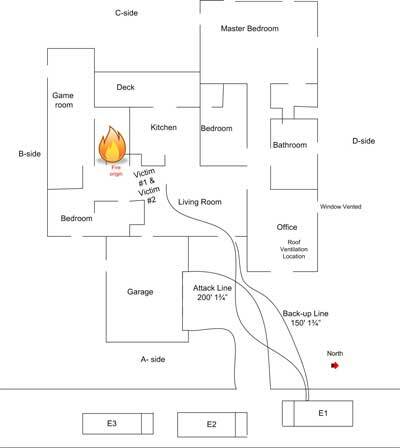 From the building floor plan and information presented in both the reports by NIOSH and the Texas State Fire Marshal, it appears that the fire was shielded and direct attack was not possible from the position of the first attack team nor the position reached by Captain Williams and Firefighter Cheek. The Fire Marshal’s report indicated that the initial attack team “penciled”� the ceiling to control flames overhead and experienced disruption of the hot gas layer and an increase in temperature at floor level. Just as ventilation must be appropriate and coordinated with interior fire attack, fire control must also be appropriate and coordinated with tactical ventilation. Cooling the hot gas layer is an appropriate tactic to create a buffer zone and increase the safety of the attack team as they access a shielded fire. However, penciling (use of an intermittent application of a straight stream) the ceiling is an ineffective method of cooling the hot gas layer and results in excessive steam production. In addition, cooling the hot gas layer is not an extinguishment technique; it must be integrated with other fire control methods such as a direct attack on the seat of the fire. NIOSH death in the line of duty reports must explicitly address the effect of tactical operations, particularly where effectiveness or ineffectiveness was a contributing or causal factor in the LODD. While this assessment has been quite critical of NIOSH’s investigation of traumatic fatalities involving extreme fire behavior, it is important to emphasize that with all its faults, the Firefighter Fatality Investigation and Prevention program is a tremendous asset to the fire service. Emphasize the criticality of understanding fire behavior, causal factors in extreme fire behavior, and the influence of tactical operations such as fire control and ventilation. Increase attention to building, smoke, air track, heat, and flame indicators when investigating incidents which may have involved extreme fire behavior as a causal or contributing factor in LODD. Examine training in greater detail, with specific emphasis on fire behavior, situational assessment, realistic live fire training, and crew resource management. Provide fire behavior training to all NIOSH investigators to improve their understanding of fire development, extreme fire behavior phenomena, and the impact of tactical operations. Include a fire behavior specialist on the investigation team when investigating incidents that may have involved extreme fire behavior as a causal or contributing factor. Initiate investigations quickly to avoid degradation of the quality of information obtained from the individuals involved in the incident and other witnesses. National Institute for Occupational Safety and Health (NIOSH). (2008). Death in the line-of-duty… Report 2007-29. Retrieved November 14, 2008 from NIOSH http://www.cdc.gov/NIOSH/FIRE/reports/face200729.html. International Fire Service Training Association. (2008) Essentials of Firefighting (5th ed). Stillwater, OK: Fire Protection Publications. The upward trend in the rate of firefighter fatalities due to trauma during offensive, interior firefighting operations. Failure of NIOSH to adequately address fire behavior and limited understanding of fire dynamics as a causal or contributing factor in these fatalities. The issues that I raised at the 2006 stakeholder meeting continue to be a significant concern. In 2007, extreme fire behavior was a causal or contributing factor in 17 firefighter line of duty deaths (LODD) in the United States. Where these incidents were investigated by NIOSH, the investigations, subsequent reports, and recommendations did not substantively address the fire behavior phenomena involved nor did they provide recommendations focused on improving firefighters and fire officers understanding of practical fire dynamics. In the 20 months since the 2006 stakeholder meeting, NIOSH has implemented a number of stakeholder recommendations. However, Death in the line of duty reports continue to lack sufficient focus on fire behavior and human factors issues contributing to traumatic fatalities during offensive, interior firefighting operations. Where these reports could provide substantive recommendations for training and operations that would improve firefighter safety, they continue to provide general statements reflecting good practice. While the recommendations contained in NIOSH Death in the line of duty reports, are correct and critically important to safe and effective fireground operations, they frequently provide inadequate guidance and clarity. In incidents involving extreme fire behavior, investigators frequently fail to adequately address the fire behavior phenomena involved and the implications of the action or inaction of responders. In addition, while training is addressed in terms of national consensus standards or standard state fire training curriculum, there is no investigation as to how the level of training in practical fire dynamics, fire control, and ventilation strategies and tactics may have impacted on decision making. Presentation of these issues in general terms does not provide sufficient clarity to guide program improvement. Examination of a recent death in the line of duty report will be used to illustrate the limitations of these important investigations and reports in incidents where extreme fire behavior is involved in LODD. There are many important lessons to be learned from this incident and the limited information presented in this report. 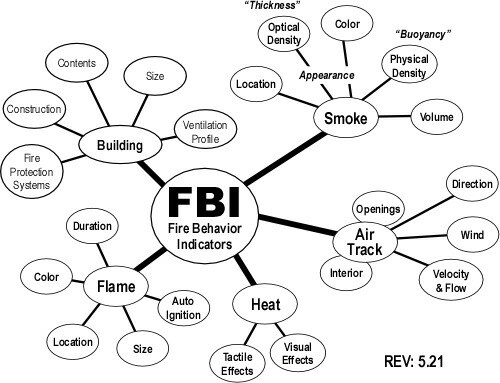 However, this analysis of Report F2007-29 focuses on fire behavior and related tactical decision-making. This analysis is completed with all due respect to the individuals and agencies involved in an effort to identify systems issues related to the identification and implementation of lessons learned from firefighter fatalities. On August 3, 2007 Captain Kevin Williams and Firefighter Austin Cheek of the Noonday Volunteer Fire Department lost their lives while fighting a residential fire. Neither this information nor any reference to the report on Firefighter Fatality Investigation FY 07-02 released by the Texas State Fire Marshal’s Office was included in NIOSH Death in the line of duty report F2007-29. This is critical to locating additional information regarding the incident. Even more importantly, it is important to remember that firefighter LODD involve our brother and sister firefighters, not simply “Victim #1″� and “Victim #2”. This incident involved a 2700 ft2, wood frame, single family dwelling. The fire was reported at 0136 and the first unit arrived on scene at 0150. The crew of the first arriving engine deployed a 1-3/4″� (45 mm) hoseline and positive pressure fan to the door on Side A. NIOSH Report F2007-29 reported that the attack team made entry at 0151 but backed out a few minutes later due to flames overhead just inside the front door and that positive pressure was initiated at 0156 prior to the attack team re-entering the building. Firefighters Joshua Rawlings and Ben Barnard of the Flint-Gresham VFD pulled rack line 2, a 200� long 1.3/4” (45 mm) � line, to the front door on Side A.� Flint-Gresham VFD Firefighter Robles conducted a quick survey of the north side and then positioned the vent fan at the front door to initiate Positive Pressure Ventilation (PPV). Robles stated that the PPV was set and operating prior to entry by the first attack team. Robles stated that he started to survey the south side and noted heavy black smoke from the top half of a broken window. He stated that he reported this to the IC. Flint-Gresham Firefighters Barnard (nozzle) and Rawlings (backup) entered through the open front door and advanced 8-10 feet on a left hand search. This attack team noted flames rolling across the ceiling moving from their left to their right as if from the attic. Rawlings stated that flames were coming out of the hallway at the ceiling area and around the corner at a lower level. Barnard reported the hottest area at the hallway. The interior attack team then backed out to the front doorway and discussed their tactics. After a brief conversation, Rawlings took the nozzle with Barnard backing him and they re-entered. They entered approximately 10 feet and encountered flames rolling from their left to their right. They used a “penciling technique”� aimed at the ceiling to cool the thermal layer. Rawlings reported in interview that there was an increase in heat and decrease in visibility as the thermal layer was disrupted and heat began to drop down on top of them. There is an inconsistency between the NIOSH and Texas State Fire Marshal’s reports regarding the timing of the positive pressure ventilation. The NIOSH report indicates that positive pressure was applied between the first and second entries by the attack team. However, in the Fire Marshal’s report, Firefighter Robles is quoted as stating that positive pressure was applied before entry. This seems to be a minor point, but if effective, positive pressure ventilation would have significantly changed the fire behavior indicators observed from the exterior and inside the building. Recognition of this discrepancy along with a sound understanding of practical fire dynamics would have pointed to the ineffectiveness of tactical ventilation and potential for extreme fire behavior. The NIOSH report did not identify the fire behavior indicators initially observed by Firefighter Robles or the attack team, nor did they draw any conclusions regarding the stage of fire development, burning regime (fuel or ventilation controlled), or effectiveness of the positive pressure ventilation. NIOSH Report F2007-29 did not speak to the fact that none of the first arriving personnel verified the size and adequacy of the existing ventilation opening, the potential implications of inadequate exhaust opening size, and the need to verify that the positive pressure ventilation was effective prior to entry. In addition, the initial attack crew observed flames moving toward the point of entry, which would not be likely if the positive pressure ventilation was effective. However, no mention was made in the NIOSH report regarding conditions inside building and the observations of the attack team. Window size is not specified, but it is likely that the opening was significantly less than the area of the inlet being pressurized by the fan. Inadequate exhaust opening area leads to excessive turbulence, mixing of hot smoke (fuel) and air, and can lead to extreme fire behavior such as vent induced flashover or backdraft. Recognition of this discrepancy along with a sound understanding of practical fire dynamics would have pointed to the ineffectiveness of tactical ventilation and potential for extreme fire behavior. 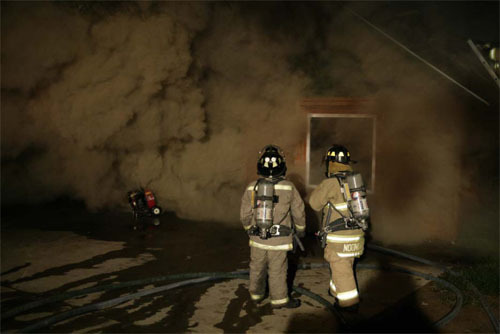 In reading this case study, it would be useful for the reader to be able to make a connection between key fire behavior indicators, the decisions made by on-scene personnel, and subsequent fire behavior. The NIOSH report did not identify the indicators initially observed by interior or exterior crews, nor did it draw any conclusions regarding the stage of fire development, burning regime (fuel or ventilation controlled), or effectiveness of the positive pressure ventilation, all of which were likely factors influencing the outcome of this incident. Firefighters Rawlings and Barnard penciled the rolling flames in the thermal layer until Rawlings’s low air alarm sounded. The Incident Commander, Captain Williams and Firefighter Cheek met Firefighters Rawlings and Barnard at the front door and a briefing occurred. Firefighters Rawlings and Barnard reported to Asst. Chief Baldauf they had the hot spots out. Rawlings stated in a later interview that they told Williams and Cheek they knocked down the fire and only overhaul was needed. At 02:13, Captain Williams and Firefighter Cheek entered the structure as attack team 2, using the same line previously utilized by Firefighters Rawlings and Barnard. Exterior crews from Noonday and Bullard started horizontal ventilation by breaking a window out on Side C (north side). Noonday Chief Gary Aarant performed a walk around, then reported heavy smoke from the B/C,and C/D� corners and at 02:15:51 asked if vertical ventilation had been started. Command then gave the order to begin vertical ventilation. Understanding what occurred in this incident requires more than the cursory information provided in the NIOSH report. Developing the understanding of critical fire behavior indicators is essential to situational awareness. Discussion of fire behavior indicators and their significance in NIOSH reports would provide an excellent learning opportunity. For example, in this incident, the difference between “smoke” as described in the NIOSH report and “heavy smoke” as reported in the Texas State Fire Marshal’s report is likely a significant difference in assessment of conditions from the exterior of the building (particularly if this is a change in conditions). NIOSH Report F2007-29 made brief mention of smoke discharge from the point of entry which was being used as the inlet for application of positive pressure. 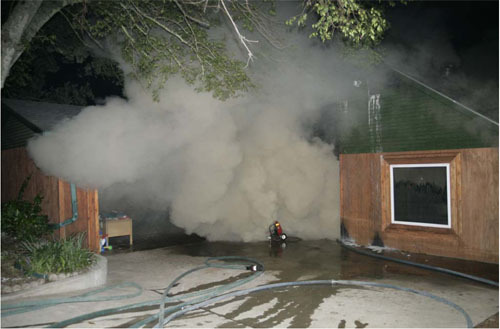 “At 0236 hours, heavier and darker smoke began pushing out of the entire front door opening and overriding the PPV fan”. However, the report does not speak to the significance of this indicator of impending extreme fire behavior. The Texas State Fire Marshal’s Report 07-02 included a series of photographs provided by the Bullard Fire Department which provided a dramatic illustration of these key smoke and air track indicators. Inclusion of these photographs in the NIOSH report would have aided the reader in recognizing this key indicator of ineffective tactical ventilation and imminent potential for extreme fire behavior. NIOSH Report F2007-29 addresses the need for the incident commander to conduct a risk versus gain analysis prior to and during interior operations. However, the report does not address the foundational skill of being able to read fire and predict likely fire behavior as a part of that process. In addition, reading the fire and dynamic risk assessment are not solely the responsibility of the incident commander. Everyone on the fireground must be involved in this process within the scope of their role and work assignment. For example, the initial and subsequent attack teams were in a position to observe critical indicators that were not visible from the exterior. While there is no way to tell, it is likely that if Captain Williams and Firefighter Cheek recognized the imminent probability of extreme fire behavior or the significance of changing conditions they would have withdrawn the short distance from their operating position to the exterior of the building. Likewise, if the incident commander or others operating on the exterior recognized deteriorating conditions earlier in the incident it is likely that they would have taken action sooner to withdraw the crew working on the interior. Understanding practical fire dynamics, recognition of key indicators and predicting likely fire behavior is a critical element in situational awareness and dynamic risk assessment. Fire behavior and fire dynamics receive limited focus in most standard fire training curricula. It is important that NIOSH examine this issue when extreme fire behavior is a causal or contributing factor in LODD. My next post will continue with the analysis of NIOSH Report F2007-29 and will make specific recommendations for program improvement. Fire Ventilation by Stefan Svensson was originally written to support ventilation training delivered by the Swedish Rescue Services Agency (R�ddnings Verket). However, the English translation of this text is an excellent resource for any firefighter or fire officer. The chapters on fire ventilation, fire behavior, and fire gases, were a necessary introduction to the topic, but other texts provide a more comprehensive examination of these important subjects. The chapters that I found most useful were The Spread of Fire Gases and Working with Fire Ventilation. Stefan’s explanation of influences on smoke movement, influence of inlet and outlet opening size, and other factors that impact the effectiveness and efficiency of ventilation operations is excellent. The narrative is simple and straightforward and shaded boxes highlight mathematical formula and calculations necessary for those who want to engage with this topic at a deeper level. For individuals without an engineering background, the mathematical explanations of the underlying principles and engineering applications may seem a bit daunting. More detailed explanation and worked examples would provide better support of this content. However, this is a minor issue which does not significantly compromise the utility of this text to a wide range of audiences. Fire Ventilation is available for on-line purchase from the Swedish Rescue Services Agency for 120 SEK (around $16.00) plus shipping. The agency will invoice for payment Swedish Kroner after your purchase (which necessitates using a bank that can produce a check in foreign currency). On November 19, 2008, the National Institute for Occupational Safety and Health will be conducting a public stakeholder meeting regarding the Firefighter Fatality Investigation and Prevention Program. This meeting will be held at 1000 hours at the Crown Plaza Hotel at Chicago’s O’Hare Airport. My next post will provide a preview of my presentation at this meeting and written testimony submitted for inclusion in the public docket. Take a minute to review NIOSH Report F2007-29 before Thursday’s post. I recently read an article in the October issue of Fire Engineering magazine titled Improving Preconnect Function and Operation. The author, LT Bob Shovald, described how his department approached the process of improving operations with small, preconnected handlines and focused on three critical factors in effective engine company operations: 1) Hose diameter and flow rate, 2) nozzle selection, and 3) hoseloads. LT Shovald made a number of good points, but misconnected on the basic science behind effective and efficient use of water for fire control. LT Shovald makes a case for high flow handlines based on changes in the built environment that influence potential fire behavior. Primarily it comes down to one important factor, gallons per minute (gpm). Using 95- and 125-gpm attack lines is outdated and dangerous. Because of the huge increase of synthetic materials in modern homes and businesses, including foams, plastics, vinyl, and volatile coatings, we are now experiencing fires with higher rates of release than ever before. Because of the high cost of energy, more homes and businesses have improved insulation. In a fire, this seals that increased heat inside the structure. As a result of more effective fire prevention programs, we arrive on-scene much sooner than in years past, in large part thanks to inexpensive smoke detectors. What this adds up to is that we are getting on-scene sooner to hotter, more aggressive fires, often just before flashover conditions or self-ventilation. To fight the beast, today we need a bigger gun with bigger bullets (i.e., proving the greater gpm and thus more water faster at the start of our interior attacks). The gpm not the pressure and not the steam kill the beast. LT Shovald’s argument for high flow handlines sounds reasonable. However, there are a few problems once you look past the surface. LT Shovald correctly makes the connection between heat release rate and flow rate necessary for fire control. All too often, firefighters think that it takes “gpm to overcome Btu”�. However, British thermal units (Btu) like Joules (J), are a measure of energy, not its release rate. Heat release rate is expressed in units of energy per unit of time, such as Btu/minute or watts (J/s). Heat release rate is the most critical factor compartment fire development. If heat release rate is insufficient (e.g., a small fire in a metal trash can) the fire will not flashover or reach the fully developed stage. On the other hand, if the fire involves a recliner or couch, heat release rate is likely to be sufficient for the fire to grow and rapidly transition through flashover to the fully developed stage. However, there is another critical factor in this scenario. Oxygen is required for the fire to release the chemical potential energy in the fuel. If doors are closed and windows are intact, the fire may quickly consume much of the available oxygen. If this occurs, heat release rate is limited by ventilation and fire growth slows. LT Shovald states that “it’s the gpm,� not the pressure, and not the steam” that extinguishes the fire. Flow rate is critical, but this is not entirely correct. Water is an excellent extinguishing agent because it has a high specific heat (energy required to raise its temperature) and high latent heat of vaporization (energy required to change it from water to steam). Of these two factors, conversion of water to steam is most significant as it absorbs 7.5 times more energy than heating water from 20o C ( 68o F) to its boiling point. The firefighters power is not simply related to flow rate, but flow rate effectively applied to transfer heat from hot gases and surfaces by changing its phase from liquid (water) to gas (steam). Extinguishing a compartment fire generally involves converting a sufficient flow (gpm or lpm) of water to steam. So while the “steam”� itself does not generally extinguish the fire, the energy absorbed in turning the water to steam has the greatest impact on fire extinguishment. LT Shovald is correct that many of the synthetic fuels used in today’s buildings have a higher heat of combustion (potential chemical energy) and given sufficient ventilation have a higher heat release rate when compared to materials such as wood and paper. True to their design, modern, energy efficient buildings retain energy during fire development, speeding the process. However, this type of building also controls normal ventilation (the building is not as “leaky” as older structures) and energy efficient windows are far less likely to fail and change the ventilation profile. As a consequence, the fire department is likely to encounter ventilation controlled fires where heat release rate is limited by the available oxygen. Early detection may also influence fire conditions as firefighters may arrive to find a pre-flashover growth stage fire when heat release has not yet peaked. 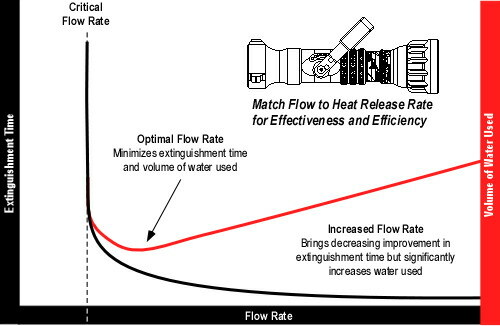 The key here is that flow rate must be sufficient to meet or exceed the fires heat release rate. Arriving earlier in the fires growth and building characteristics leading to a ventilation controlled fire, do not necessarily lead to the need for a higher flow rate, on the contrary, the required flow rate during the growth stage is actually lower than that for a fully developed fire (when heat release rate is at its maximum). However, firefighters must also consider potential increase in heat release rate that result from tactical ventilation or unplanned changes in the ventilation profile (e.g., failure of a window). One excellent point in supporting the argument for high flow handlines that LT Shovald did not raise is the large volume (floor area and ceiling height) and limited compartmentation encountered in many contemporary homes. Older homes generally had smaller rooms and were more highly compartmented. Many new homes have spacious and open floor plans, in some cases with multi-level atriums and high ceilings. In addition to frequently having open floor plans, many of these buildings are also have an extremely large floor area. This type of structure presents a significantly different fire problem and often requires a much higher flow rate than a more traditional, highly compartmented residence. Water application in a form appropriate to cool its intended target (i.e., small droplets to cool hot gases or to cover hot surfaces with a thin film of water). A flow rate of 95 or 125 gpm is only dangerous if firefighters attempt to use it to control a fire which requires (or has the potential to require) a higher flow rate. While a high flow rate will quickly extinguish a small fire, this generally results in use of considerably more water as illustrated below. Effective and efficient fire control requires that we match the flow rate to the task at hand. At the simplest level this means using 1 �”� (38 mm) or 1 �”� (45 mm) handlines for smaller fires and 2″� (50 mm) or 2 �”� (64 mm) handlines for larger fires. It may also mean placing control of flow rate in the nozzle operators hands by using a variable flow or automatic nozzle and letting the firefighter select the flow rate based on the tactical situation. What is a smoke explosion? Is it the same thing as a backdraft or is it a completely different phenomenon? In one form or another I have encountered this question several times during the last week. In one case, I was asked to review a short article about an incident involving a smoke explosion that was submitted to FireRescue magazine. In another case, I was surfing the web and came across the following video titled large smoke explosion close call on firevideo.net. What happened in this incident? Was it a smoke explosion or a backdraft? For many years, the term smoke explosion was a synonym for backdraft. In fact, if you look up the definition of smoke explosion in the National Fire Protection Association (NFPA) 921 (2007) Guide for Fire and Explosion Investigation , it says “see backdraft“. However, smoke explosion is actually a different, and in many respects more dangerous extreme fire behavior phenomenon. A smoke explosion requires a relatively cool mixture of fuel (smoke) and air within its flammable range to come into contact with a source of ignition. On the other hand a backdraft requires introduction of air to an hot, extremely ventilation controlled fire where the concentration of gas phase fuel (smoke) is high and oxygen concentration is low. Both result in an explosion, but the initiating event and indicators that may be observed by firefighters and fire officers are considerably different. Have another look at the video and see what you think: Smoke explosion or backdraft? Remember that both of these phenomena can occur in a building, a compartment, or even a small void space. Look closely at the building, smoke, air track, heat, and flame (B-SAHF) indicators. Check CFBT-US Resources more information on extreme fire behavior and reading the fire.